Learn more about our company..
2. View your cart, enter ship-to zip code and click "Show Shipping"
You will see all available shipping options and rates for your zip code. Orders are shipped within 2-3 business* days. Indicate that in the comments during checkout so we can accommodate your request. Order Tracking Number will be sent via email. We charge sales tax on orders shipped in NY state. If your organization is tax exempt, you must create an account and enter your tax certificate ID. There is no minimum dollar amount for orders. Some items may have minimum quantity requirements. Minimums may also apply for specially priced items and custom products. You can return an item within 30 days of order receipt for a refund. Please contact us to obtain an RMA number. Then complete and return the return form on the back of your packing list with your package. Please note, all food and custom-made items are non-returnable. We will issue a refund for damaged product or send a replacement. Yes, our pricing depends on purchased quantity. When a product qualifies for quantity price break it will be indicated on the product page. You will see the price adjusted depending on quantity when you add items to your shopping cart*. *If the item is on sale, the lowest discounted price will appear regardless of quantity. To receive additional offers, please sign up for coupons. You can print a catalog of all our products. Please click here. We try to minimizing the use of promotional paper materials. By doing that we keep our costs low, pass the savings onto our customers, and also decrease our environmental footprint. That's why, we do not have a printed catalog. All prices and products are current on our site. Yes, many items are available in case quantities. The price of these items is adjusted below retail often reaching wholesale level. For such items a link on the product page will indicating case quantity availability. We also accept price quote requests, please inquire. Yes, if you are in NY you will be able to select "pick up" as delivery method. Once your order is ready for pick up we'll notify you via email. What nut-free products do you have? We offer nut-free Hanukkah gelt and nut-free hamentashen which are manufactured in a nut-free facility and clearly marked "nut-free". All other products may have traces of nuts. Yes, we ship to Canada and other countries by Postal Service. However, there may be a shipping charge adjustment, in that case we will seek your approval before shipping the order. Also, please note: you, as the importer, will be responsible for paying any custom duties imposed by your country. Yes, absolutely all eatable products sold through our store are kosher. Kosher certifications vary depending on the brand. You can see individual item's kashtut in product description. 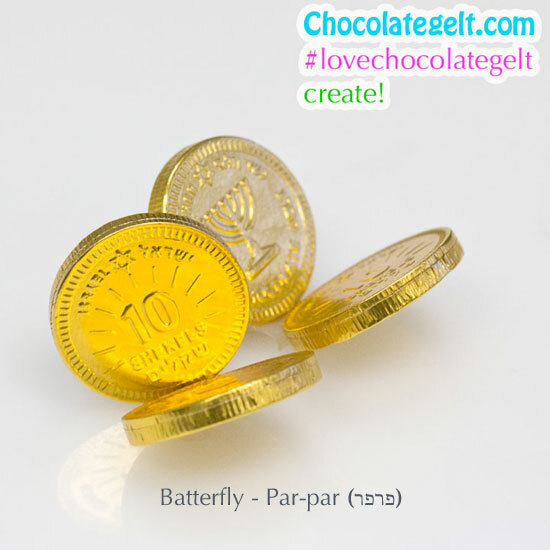 Yes, we can customize chocolate gelt, please inquire. We also offer many great party favor ideas which you can easily customize by adding a printed place card, gift card or a tag. Do you customize mishloach manot? Yes, we can customize mishloach manot. Depending on your desired product selection and gift size. We can also make custom label for hamentashen. Please inquire.